This custom lock cover is not only stylish but will keep your lock free of dirt and debris. 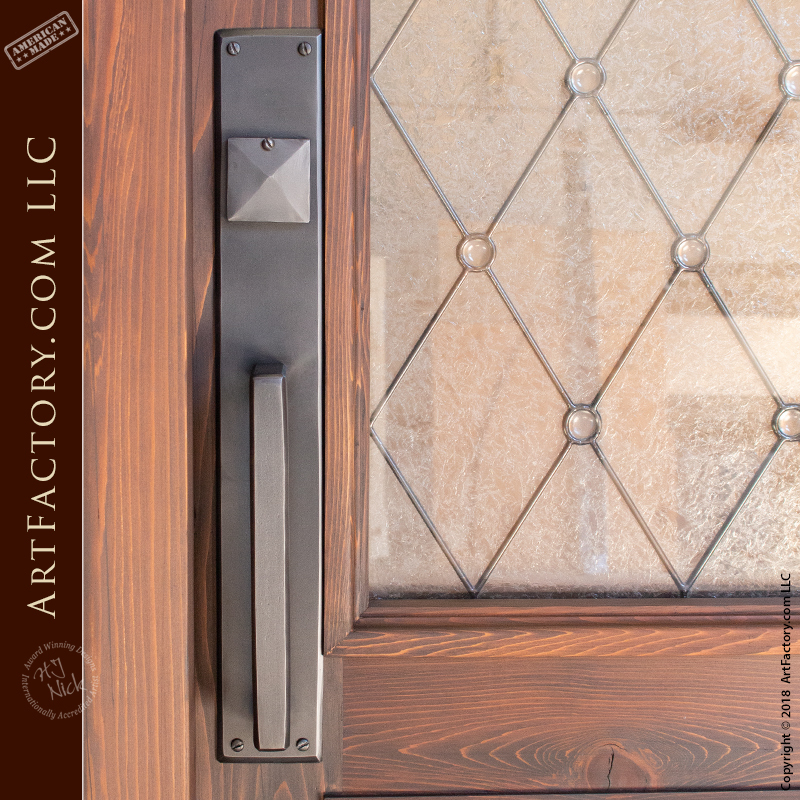 This modern style door handle from ArtFactory.com features a matching backplate and custom diamond shaped lock cover. It is ideal for any style or residential or commercial entrance door. Simplistic, yet stylish, the custom contemporary door pulls are built to stand the test of time. Like all of our custom door hardware, they are hand built from solid wrought iron by classically trained blacksmiths. What this means, is hand hammered using anvil and coal fired forge. In addition, all edges on the pulls and plates are chamfered so there are no sharp edge. Our door pulls, handles, and hardware are never mass produced, cast, drop forged, or made using any other fast process. What this means is that your hardware is built to stand the test of time. Furthermore, using solid, pure wrought iron ensures that your handles will never rust or corrode away to dust like steel or other cheap filler metals. As a result, you will receive a hardware product that stays beautiful for generations, with little of no maintenance. All of our hardware is advance patinated using a hand applied, heat infused, iron oxide process. This process advances that natural patination of the iron that normally takes decades, thus giving you an item that is beautiful from day one. Our master craftsmen apply the patina to the metal at over 1000 degrees Fahrenheit so that it infuses that patina with the molecules of the metal. This produces a high quality finish that won't flake, crack, or peel off like paints and powder coats. Our patinas are guaranteed to never fade, flake, or chip like a painted on finish. Finally, like all of our products, these contemporary door handles are built to fine art specifications under the supervision or world renowned artist H.J. Nick. The H.J. Nick seal on your custom hardware, door, gate or furnishing assures that your product is built to world class fine art standards with investment, and future antiquity value. Our combination of top quality materials and old world craftsmanship allow us to offer a quality of product that is unmatched anywhere, at any price. When nothing but the best will do, call us at 1-800-292-0008 for pricing on custom contemporary door pulls, or any of our other custom made to order, fine art quality products.